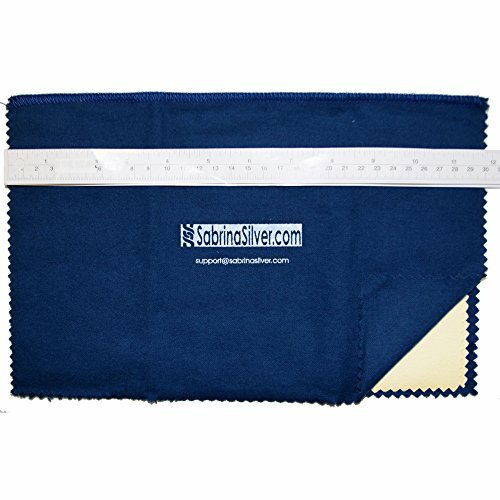 This is the BEST Jewelry Polishing Cloth we have tested and used for many, many years. It was originally made For Silver Cleaning and that's what it's Best at, but it will Clean Most Metals (as in your costume jewelry) very well. Plus since this is the largest size we make (12X15 inches), it will work and last longer, so you'll get more for your money. To avoid getting a cheap imitation, please make sure the buy box says Sabrina Silver. *And Please keep in mind: To keep your silver clean you must EITHER be constantly be wearing your jewelry (except in swimming pools), OR: YOU MUST STORE your silverware, jewelry or musical instruments IN A RE-CLOSABLE PLASTIC ZIP-BAG and away from open air, or any natural rubber material. We ship most of the silver jewelry we sell in such a bag for that purpose, we recommend that you do not trash those bags.